On the 18th of January this year, a new Estonian Startup Visa programme was launched, initiated by the local startup community and the Estonian Ministry of Interior, allowing non-EU nationals to come and work for Estonian startups, relocate their existing startups or found new ones in Estonia on preferential terms. Now, the programme has seen a highly successful first month with over 50 applications received from more than 10 countries. Out of all the applications submitted in the first month, the Startup Committee has given a positive evaluation on 14 applications, negative on 22, declined 9 and is processing 6. After a positive evaluation, the startups can proceed to applying for a visa or a permit at an Estonian Embassy or the Estonian Police and Border Guard Board, who is already processing the first applications. Majority of the applicants for the Startup Visa are the nationals of Ukraine, Belarus, Russia and India. In terms of the field of activity of the startups, a good variety is presented with topics ranging from aviation to marketing and telemedicine to tourism. The first foreign employees have already been successfully recruited and arrived to Estonia. 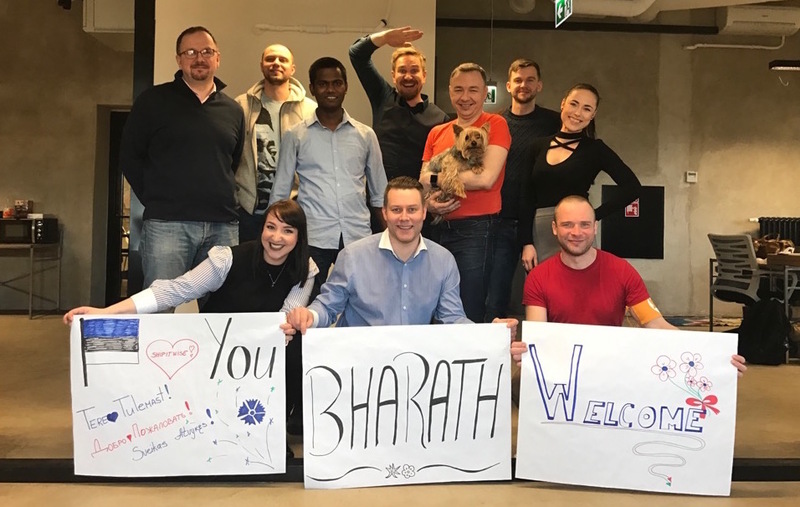 One of the first foreign employees to arrive was an Indian software engineer who was welcomed by the team of Shipitwise, a full-service shipping platform startup, on Tuesday at the Tallinn Airport. Additionally, the startup is in the process of hiring another seasoned software developer from South Africa. “The main reason why we instantly grabbed from the opportunity presented by the Startup Visa is our strong wish to build an international culture at Shipitwise,” said Ragmar Saksing, the co-founder of Shipitwise. “The easier the access to smart and motivated people, the more competitive we are on a global scale,” added Saksing on the importance of the Startup Visa. Shipitwise recruited their new employees via a fellow Estonian startup Jobbatical, a platform that connects globetrotting talent to tech companies, and had the employees go through a 3-week intensive bootcamp to test their skills and motivation. “When we launched the Startup Visa programme, we couldn’t really predict any numerical outcomes for the programme as there is very little public data and statistics available for the competing countries and their similar programmes, but we are very positively surprised by the amount of interest for our Startup Visa. It is going to be exciting seeing the addition of the new startups and foreign employees to our local startup community and the positive impact this will hopefully have,” commented one of the initiators of the Startup Visa, the Head of Startup Estonia, Mari Vavulski on the programme’s first month’s results. The terms and opportunities of the Startup Visa programme can be found in more detail on Startup Estonia’s webpage and the webpage of the Estonian Police and Border Guard Board.